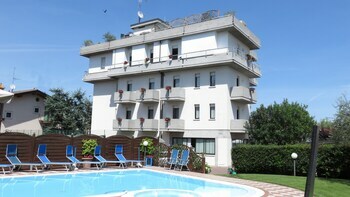 Located in Desenzano del Garda, Hotel Albergo Al Cacciatore is within a 15-minute walk of Desenzano Castle and Montecroce Farm and Oil-Mill. Featured amenities include complimentary newspapers in the lobby, luggage storage, and an elevator (lift). Free self parking is available onsite. Located in Fasano, Masseria Torre del Diamante is by the sea, a 4-minute drive from Dune Costiere Regional Natural Park and 6 minutes from Torre Canne Beach. Free self parking is available onsite. With a stay at Agriturismo La Lodola in Asciano, you'll be 16.9 mi (27.2 km) from Piazza del Campo and 16.9 mi (27.2 km) from Civic Museum. When you stay at Azienda Agrituristica Le Chiuse in Augusta, you'll be 13 minutes by car from Agnone Beach. Free self parking is available onsite. Located in Oristano, Agriturismo Cuccuru Aiò is in a rural location, within a 15-minute drive of Tower of St. Christophoros and Church of Santa Chiara. Free self parking is available onsite. With a stay at Angeli di Matilde in Rome (Pigneto), you'll be within a 15-minute drive of Colosseum and Basilica di Santa Maria Maggiore. With a stay at Tiburtina House in Rome (Nomentano), you'll be within a 10-minute drive of Borghese Gallery and Villa Borghese.